The No. 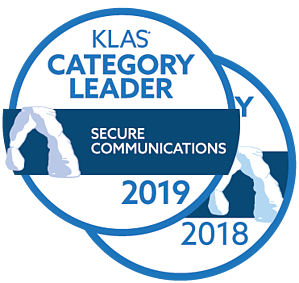 1 KLAS-rated vendor for secure communication platforms, Telmediq solves the fundamental challenges, risks and financial costs associated with poor clinical communication. Our healthcare communications hub pulls together disparate hospitals systems—EMR, nurse call, clinical alarms, call centers and call schedules—into one powerful and integrated platform for HIPAA-compliant communication and care coordination. In 2019, we announced that Telmediq joined the PerfectServe family. The combined power of PerfectServe and Telmediq to connect physicians and nurses across the healthcare continuum creates a clear choice for healthcare organizations looking for wide-ranging care team collaboration functionality, higher service levels and the latest advancements in technology. Our team believes that clinical communications are about process and people just as much as they are about technology. We work with our customers daily, implementing their visions for better healthcare communications into our SaaS-based offering. Everyone who joins our company shares in our mission to improve patient outcomes. At Telmediq, we have expanded our client base to more than 300 healthcare organizations and 80,000 users within the U.S. We leverage the latest standards, such as FHIR, to fully integrate with the EMR. A lengthy hospital stay for Ben’s wife and newborn daughter in 2010 introduced him to the cumbersome state of clinical communications. Struck by the irony of watching physicians wrestle with pagers and telephone tag while their patients used state-of-the-art iPads, he became determined to discover a better system. After considerable research and close collaboration with several well-respected U.S. healthcare institutions, Telmediq was launched in early 2012. Ben continues to be the driving force behind Telmediq’s product innovation. He is best known for connecting with customers directly to understand their challenges in order to optimize product development. He has authored patents in location-based emergency messaging. Ben holds a bachelor’s degree in Systems Engineering from the University of Waterloo, as well as a degree in Pragmatic Product Management. Ben has also played key management roles in two high-growth technology success stories—online learning platform Desire2Learn and global OSS/BSS software provider Redknee Solutions—serving in product, business and leadership positions. As Principal of Livingston Growth Capital, John lends his expertise and funds to technology start-ups in the Pacific Northwest. John served as Chairman and Chief Executive Officer of Absolute Software Corporation, which he co-founded in 1995 with Christian Cotichini, leading a dedicated team to grow the company from an idea to a global organization reaching approximately 430 employees, $100M in sales and $17+M cash flow, per annum. Today Absolute is a leader in mobile computer security and management and has technology and business relationships with the world’s largest computer and smartphone manufacturers. John guided the company through an IPO on the TSX in 2000, and the company reached a billion-dollar market capitalization in 2007. John holds an M.B.A. from the University of Calgary, with a focus on Entrepreneurship and Innovation. He was also a Faculty Member of the School of Business at the British Columbia Institute of Technology, teaching Entrepreneurship, Small Business Management and Product Development. Alex oversees the technical architecture, product design and operational deployment of the Telmediq network, leading an expert team of developers who constantly work to improve scalability and reliability of the Telmediq service. Alex has held senior development and architecture roles with several leading software organizations. He also launched his own business venture, Radial Media, which is an innovative peer-to-peer networking technology used for mobile advertising. Alex holds a Bachelor’s Degree in Computer Science from the University of Victoria. Scott maintains the integrity of the Telmediq network and safeguards the privacy of Protected Health Information. In partnership with customers, he leads the adoption and integration of Telmediq’s communications hub and chairs Telmediq’s Communication Advisory Board. Prior to joining Telmediq, Scott spent more than 15 years in management consulting, starting at Ernst & Young in 2000. He has significant experience managing large Transformative Change Initiatives in both business operations and IT program roles, some with budgets exceeding $100M+. Scott holds a B.A.Sc. in Systems Design Engineering, and a Master of Management Science (M.M.Sc.) from the University of Waterloo. Gabrielle brings 25 years of B2B marketing experience to the Telmediq team, leading the efforts to communicate the company’s mission of improving patient care with better collaboration technology. She works closely with the sales team and with clients to provide the information health systems need to connect clinicians with the right technology solutions. Gabrielle’s long-standing commitment to health and wellness led her to launch NutHut.ca, an online raw organic food distribution company. She served as its CEO for nearly five years before selling the company in 2015. Gabrielle holds a Bachelor of Commerce degree from the University of Victoria and is an active member of BCAMA, the AMA and CMO Council. Her multi-channel demand generation campaigns have been featured at IBM’s Insight conference for two consecutive years, and her expertise with marketing software has garnered accolades from IBM, RKO and ACL.